I was recently doing a TRACERT command and was attempting to paste IP address' into the DOS window. This required me to click on the icon in the top corner several times, which was a royal pain. In my previous employment we used mostly Windows 2000 machines and remembered that this was much easier. Here at Corillian I am in the world of XP and 2003. After looking at the properties of the DOS window I realized that there was a property called 'Quick Edit Mode' that was unchecked. This particular option allows you to immediately copy text in a DOS window by highlighting it with left mouse click. You can then copy the text with a right mouse click, and finally paste the text with an additional right mouse click. 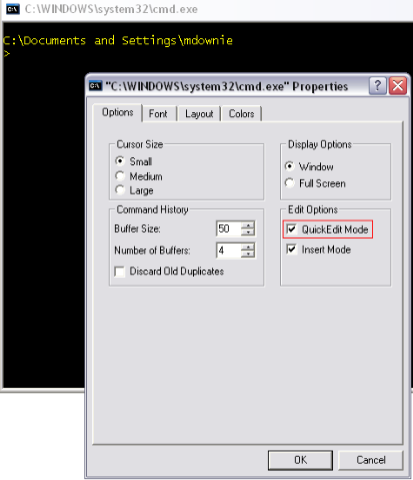 This actually makes the XP\2003 DOS prompt work like the defaults of Windows 2000.